Diastasis recti (also known as abdominal separation or split abs) is a serious condition surrounded by plenty of misinformation. I am passionate about empowering and educating my clients on how to help them heal their diastasis non-surgically if at all possible. Diastasis recti is a separation/widening of the fascia (connective tissue) that connects your rectus abdominis (six pack) ab muscles. Normally, the two sides of the muscle are joined at the linea alba at the bodys mid-line. Symptoms include, but are not exclusive to: a football like dome or a chasm appearing along the torso mid-line during upper ab curls, low back pain, a poochy pregnant like belly, organ pulsing and incontinence. 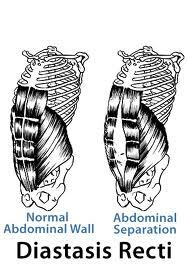 It is possible to tone the connective tissue and strengthen the underlying abdominal wall (transverse abdominis) which can result in a decreased separation between the left and right rectus ab muscles. There exists a plethora of opposing information about diastasis recti and how to heal it, everything from surgery, to strict physical regimens to splinting. A few resources that I trust and would start with are Katy Bowman’s book Diastasis Recti, this downloadable brochure from one of the pioneers in diastasis recti research; Canadian PT Diane Lee. You can also check out my YouTube channel for short videos of exercises that are safe for diastasis recti. Ironically, doing lots of upper ab curls (crunches) in an effort to heal your diastasis will only make the situation worse. By doing lots of crunches, you are only strengthening your rectus abdominis in its separated state, not bringing it back together. This is where your very own internal muscular ab corset comes into play. 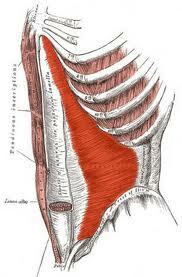 Say hello to your new best friend, transverse abdominis (TVA). In severe cases, especially those that are accompanied by an umbilical hernia, the abs may not return completely to their original position but their separation can be improved significantly. Additionally, when there is more than a three finger width separation, the wearing of a splint is highly recommended. The splint, not only provides much needed support, but also speeds up the recovery process by approximating the muscles back into their original position. A diastasis splint is different than spanks or a belly band, both of which compress the ab muscles rather than bringing them back together. If you do have abdominal separation, you’ll need to do adopt a more intense and disciplined approach to heal. In my Preggo Pilates program, we focus on Pilates exercises that reinforce and strengthen your TVA as well as address your unique physical needs and goals. For more in-depth core work, assessment and treatment of split abdominals and a stimulating and fun overall body workout to increase strength, tone and postural awareness contact me. Why Do I Need A Diastasis Intake? You may already know that you have a diastasis, but it’s important for me to take the time to assess width, depth and length, so that I can better assist you in healing it as well as determine whether wearing a splint is advisable for a quicker recovery. The intake is also an opportunity for me to get to know you and your individual situation a bit better so that I can develop an exercise homework plan that suits your particular life circumstances. During the intake clients often discuss personal and/or intimate physical details that would not be appropriate for a group setting yet are essential for me to know in order to move forward with a diastasis healing program. The overall picture I get from the intake clarifies if there would be any need for me to refer you to other practitioners regarding symptoms/conditions that are outside my scope of practice. I look forward to supporting your core transformation. If you have a diastasis, this is the perfect class for you! Check the calendar to see when the next class cycle begins. Diastasis Class Series usually run in 8-12 week cycles. Mamas only, no babies in tow, so that you may focus completely on your workout session. For all you Mamas who need support in healing your split abdominals this class provides the perfect opportunity to deepen your Pilates practice while also learning exercises aimed at specifically bringing your abs back together. This group will also help keep you on track with your homework exercises. Homework exercises, support and guidance provided. Each group is limited to 3-5 participants. If you have not already had a diastasis intake and assessment with Stephanie you will need to schedule one prior to beginning the class. See rates. Please contact me to reserve your spot and/or schedule an intake. Please mention the day(s) and time(s) you are choosing.